LOUISVILLE, Ky. (BP) — “Stay in the story.” That’s the advice retiring missionaries Nik and Ruth Ripken offer the next generation. Those in-depth conversations shaped the Ripkens’ lives and legacies. 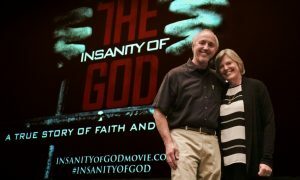 Their research, which spanned 15 years, resulted in hundreds of interviews and culminated in two books, “The Insanity of God” and “The Insanity of Obedience,” and the feature film, “The Insanity of God.” More than 90,000 people in 800 theaters viewed “The Insanity of God” when it was released in August and September 2016. “Beyond &#91;Timothy’s death&#93; was figuring out how I continue to serve and live and be who I need to be post that,” Ruth said.